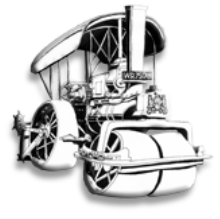 Friends of Pudsey Roller continues its successful fund raising series of Pie and Pea Suppers on the theme of Transport and Steam twice a year, usually late spring and late autumn. Our next one, illustrated left, we expect to be very well attended with members and friends enjoying the evening’s proceedings and of course the pie and peas! Farsley Liberal Club in Leeds has hosted the Friends Pie and Pea Suppers since October 2011 and is, as always, very good to us. 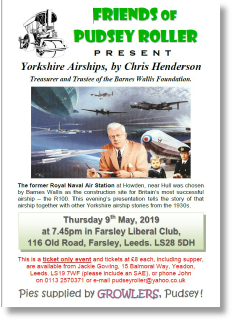 Please come along to this entertaining talk and support both the fund raising efforts for the Pudsey Roller and the Farsley Liberal Club, with its licensed bar, while enjoying traditional Yorkshire pie and peas (with mint sauce, if you like!). We generally include a raffle, with prizes donated by members, and sales items and membership may also be obtained at this event. E-mail pudseyroller@yahoo.co.uk or phone Leeds (0113) 2570371 to book your place on what promises to be a very enjoyable evening.